Most successful things in life originate in a very humble way, and the Gloster Canary was no exception. The very first steps in the creation of the Gloster goes back to the years after the end of the first world war in 1919 and 1920. Mrs. Rogerson from Gloucestershire was a lady whose firm believe was "all things that were small, were beautiful." She was keenly interested in grafting and development of bonsai trees and bushes. In 1920 she became very interested in canaries and in particular the Crest and Crest Bred birds, but she very strongly disliked all the excessive amount of long uncontrolled feather that these type of canaries had. Mrs. Rogerson felt that if she could breed a canary that was only half the size of the existing Crest and which had a much smaller and neater feather, then such a canary would be far more attractive to look at. After much thought on the subject she worked a breeding programme to commence her objective. Mrs Rogerson purchased a few crested Roller canaries and these were paired up to some very small Borders obtained from a breeder J.H. Madagan. The Border of 1920 was very much smaller in all respects to the Border of today. 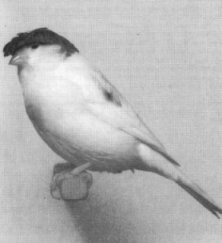 While Mrs. Rogerson was making her first attempt to breed a miniature Crested Canary, in Scotland, John McLay who was a well known breeder and judge of Crested canaries, started also to breed a miniature of the then quite popular Crested canary. John McLay's idea was to use his smallest Crests and pair them up to the smallest Borders that he could obtain. While these two dedicated breeders were parenting this new type of canary, reports of what they were doing became known to what I would describe as the U.K.'s best known canary fancier at that time, A.W. Smith, and he encouraged Mrs Rogerson and John McLay in their efforts and from time to time they exchanged breeding stock. Such was the progress made by Mrs. Rogerson in her breeding success that through the persistence of A.W. Smith she agreed to enter two of her miniature Crests at the London National Show held in 1925. As these two canaries were completely different in appearance to the normal Crests, they were allocated a separate class of their own and were awarded first and second prize. This was the first time that this canary had been exhibited in public, and fanciers were able to see at a very early stage the birth of a completely new "Type" canary the foundation of which consisted of small crested rollers, small Crests and the smallest "Wee Gems" - the early Border. In view of the fact that Mrs Rogerson was the first fancier to create this new type of canary and she lived in Cheltenham, Gloucester, A.W. 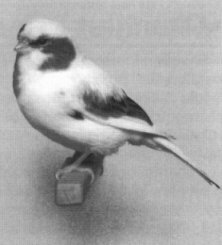 Smith said that he thought the Bird should be known as the GLOSTER canary, the one which had the crest should be called CORONA and its breeding partner which had a normal head should be called a CONSORT. In 1925 the Gloster made its first appearance on the show bench, then as it was slowly increasing, along came the second world war which put a complete stop to the holding of canary shows for the next seven years and then slowly the whole canary fancy began to come to life once more bringing with it a vigorous following of Gloster breeders. Undoubtedly the fanciers who were mostly responsible to revive the Gloster in 1946 were Fred Bryant and his wife Vera. All present day Gloster breeders who never met the Bryants should be very grateful to them for their efforts and skill in setting the early standards and were truly rresponsible for making the Gloster what it is to-day regarding its popularity. The Gloster Fancy has had to overcome great mountains of resistance to overcome and rise up so high. The Gloster fancy of to-day is even better poised to continue its forward movement to even greater success for two reasons, (1) the fancy has never had so many able fanciers all of whom are pressing each other very hard on the show bench. No longer is just one fancier leading from the front and (2) the fancy has specialist clubs whose officials are very competent. I can personally vouch that a lot of success of the leading Club, the I.G.B.A. (International Gloster Breeders' Association) is the quality and dedication of its Officials such as Tony Southern and Allan Potts. They joined the Society as school boys and it was obvious to the older more experienced members that here were two future leaders of the fancy.